It’s Manatee Appreciation Day! These gentle giants can grow to… – Sig Nordal, Jr.
March 28, 2018 March 28, 2018 Sig Nordal, Jr.
It’s Manatee Appreciation Day! These gentle giants can grow to over 14 feet in length and weigh over 3,000 pounds. Also, known as “sea cows,” manatees feed on seagrasses and other aquatic plants. Today, the total population is estimated to be at least 13,000 manatees, with more than 6,500 in the southeastern United States and Puerto Rico. When aerial surveys began in 1991, there were only an estimated 1,267 manatees in Florida. 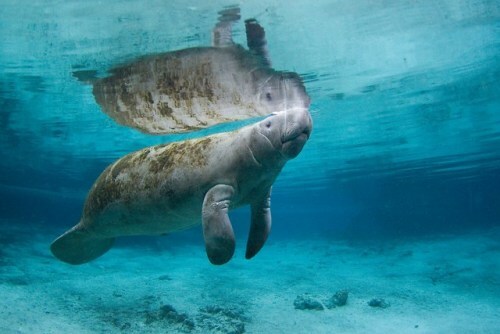 Check out more fun facts about manatees: https://on.doi.gov/2fpJzxv Photo from Crystal River National Wildlife Refuge Complex by U.S. Fish and Wildlife Service.